Earlier today (December 2, 2016) I saw a post on Twitter that linked to a Book Riot review of Bad Little Children's Books: Kidlit Parodies, Shameless Spoofs, and Offensively Tweaked Covers by Arthur Gackley. It isn't for kids. Published in September of 2016 for the adult market, people in children's lit are talking about it. The Book Riot review, by Kelly Jensen, is titled It's Not Funny. It's Racist. In short, this "parody" is a play on genocidal acts. Native people were given blankets infected with small pox. Tim Tingle's outstanding work of historical fiction, How I Became A Ghost, has that fact in it. Abrams lists "Arthur C. Gackley" as the author of Bad Little Children's Books. I don't know if that is a real person or not. That doesn't matter, though. 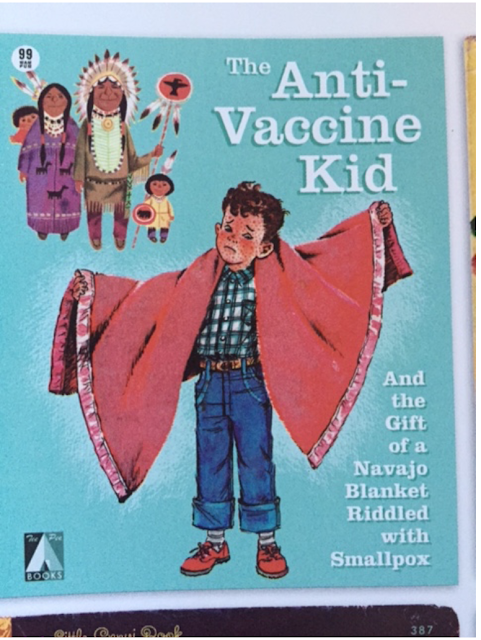 The point of this particular page is to suggest revenge, with a Native family giving a white kid smallpox, and smiling as they look upon him. That alone is disgusting. Genocidal acts are not the stuff of humor. Did the people who put this together think that the Indian family they put on the cover is Navajo? Did they use "Navajo" because they've heard about Navajo blankets? Do they realize they've used a stereotypical image to represent the Navajo family? Because this is, ultimately, a book of parody, do any of my questions even matter?! In some discussions of the book, I'm seeing that people realize the smallpox part is disgusting, and maybe they think that's enough. But, I think it is also important to note that Abrams is using stereotypical imagery and calling it Navajo. This book, Abrams, is a despicable failure. Eds. note: Please scroll down to see additional review content, submitted on December 5, 2016. PebbleGo Next is the next step in research for students grades 3-6. Launching with a States and American Indian studies module, PebbleGo Next is carefully aligned to grades 3-6 curriculum objectives. The databases is simple to navigate and offer key reading supports such as read-along audio and word-by-word highlighting along with a variety of downloadable, including prompts to inspire critical thinking. PebbleGo Next is published by Capstone. On their page, they write that they're the leading provider of nonfiction materials for struggling and reluctant readers. The "American Indian" content of the PebbleGo Next database is arranged in geographical sections, called "Cultural Areas." Framing our nations as cultures is a typical error. We are--first and foremost--nations. A better arrangement would be something like "Tribal Nations in the Southwest" instead of "Southwest Culture Area." Not using our status as nations means that PebbleGo Next has no way to address important facts, like this one: we have jurisdiction over our reservation homelands. at the Pueblo tab in the "Southwest Culture Area,"
I do not recommend the PebbleGo Next database. The single, most significant error, is the failure to use the word "nation" to describe the Pueblo Nations of the southwestern part of the U.S.
We do not call our ancestors "Anasazi" which means "Ancient Ones." Anasazi is a Navajo word. The best way to refer to our ancestors is... ancestors. Use of "the Ancient Ones" in "After a drought in the 1300s, the Ancient Ones moved south and built villages along the Rio Grande River" is awkward. Better to say something like "After a drought, the Pueblo peoples moved south and built villages along the Rio Grande River." The information about Pueblo homelands being "ruled" by Spain from the 1500s to 1821, and Mexico from 1821 to 1848, and then the US from then on, is simplistic. Each of those nations (Spain, Mexico, U.S.) recognized the Pueblo peoples as nations. This was acknowledged by a series of canes, given to Pueblo leaders, by officials of those nations. The last one was from President Lincoln. For reference, see the documentary, Canes of Power. Use of "Anasazi" in the timeline is incorrect. The entry for 1680, in the timeline, is incorrect and incomplete. That year (1680), the Pueblo Nations drove the Spanish out of our homelands. All the information is in past tense. Finally, a page with a present tense word ("Today...") but the information is too broad and some of it is incorrect because of the broad description. It is good that present tense is used, but why is the section called "Beliefs" rather than Religion? Information, as with the page on Government, is too broad, making some of it incorrect. In the first paragraph, past tense is used to describe traditional dances, ceremonies, and prayer. The second paragraph is written in a way that suggests that we've moved away from that, to doing it for tourists and as "festivals" that we "celebrate throughout the year." That is inaccurate. The description of our traditional homes "sometimes covered in adobe" is inaccurate. Our traditional homes are made of adobe bricks, and, plastered with adobe mud, and/or stucco. The information on "jobs" is incomplete. Native people do more than just work in factories, vineyards (?) and uranium mines. Some of us are teachers, lawyers, engineers, librarians. The line that "many return home to their villages on the weekends" suggests that those with "jobs" can't live in their homes on reservation lands each night, which is not true. Some do, some don't. Written as it is, the suggestion contributes to a perception that our homelands are isolated and stuck in the past, which isn't true. I have navigated through PebbleGo Next and also found a lot of issues. The section on Muscogee (Creek) Nation fails to mention much about land allotments after the Trail of Tears, and it only briefly mentions the Dawes Act in its timeline; nary any mention of the implications of signing and forced signings thereafter, as well as how its used as a roll now for tribal enrollment. Just a few things I noticed. The history section just MENTIONS the Indian Removal Act and the Trail of Tears, in the timeline only and not in the narrative section. Big mistakes and blaring holes. I also did a cursory read through some of the other tribes to which I have personal affiliation via friends and family (Navajo, Isleta Pueblo). I was disturbed on a basic level just about the language used--so much past tense BEYOND the history section and many problems with the Modern Life section. Take for instance the section of Navajos--it mentions they are weavers and jewelers but CAN also have other jobs. This is similar to a book I weeded from our collection about the Navajo which said "they even like to wear blue jeans!". Just wanted to give you some quick feedback about what I noticed. This would not be a complete or appropriate resource in my opinion. Over the last few days, there has been online discussion about racial stereotypes in connection with one of our upcoming 2016 titles, The Continent, by Keira Drake. As the publisher, we take the concerns that have been voiced seriously. We are deeply sorry to have caused offense, as this was never our or the author's intention. We have listened to the criticism and feedback and are working with the author to address the issues that have been raised. We fully support Keira as a talented author. To ensure that the themes in her book are communicated in the way she planned, we will be moving the publication date. HarlequinTeen joins a growing number of publishers, in 2016, who have responded to concerns with stereotypes, bias, or microaggressions in their books. See AICL's log of revisions.